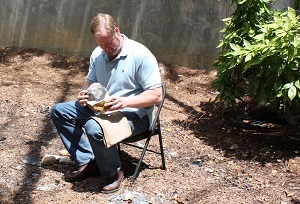 The Paleolithic Technology Laboratory studies the behavioral, cognitive, and neural bases of toolmaking in order to understand the evolutionary history of the human mind and brain. 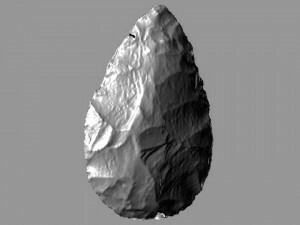 Research focuses mainly on Oldowan, Acheulean, and Levallois technologies, using a combination of lithic analysis of archaeological specimens, experimental production of stone tools, and measurements of motor action, neural activation, and brain anatomy related to toolmaking. 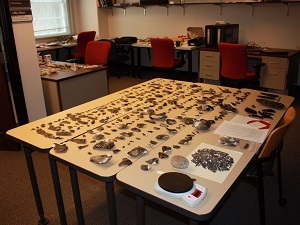 For a description of ongoing projects, see the Research page. Traditional lithic analysis. 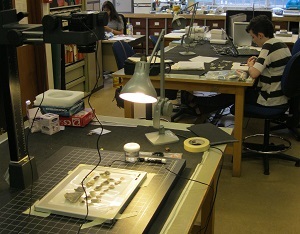 The lab includes storage for experimental and ethnographic collections, a large open area with tables for working with artifacts, two computer work stations for data analysis, digital scales, calipers, etc. 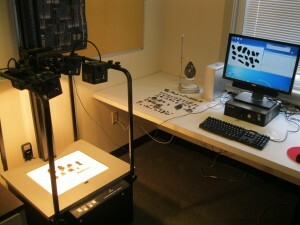 Digital image analysis. A Canon EOS SLR camera with zoom lens, Bencher Illuma imaging stand with built-in base illuminator, and ImageJ processing software enable automatization of measurements like surface area, length, and width, providing an alternative to traditional manual lithic analyses. 3D scanning. 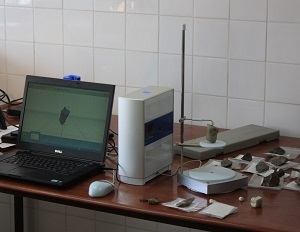 A portable NextEngine 3D Laser Scanner run by ScanStudio HD Pro software can be used in the lab or in the field to acquire 3D images of artifacts. Image analysis is supported by Rhinoceros 4.0 NURBS modeling software. Experimental flintknapping. An outdoor area right outside the lab has seating and storage for materials. The lab’s Canon Vixia HF S200 HD camcorder and tripod can be used to record knapping gestures and behavior sequences for analysis. Structural and functional imaging There is a new Siemens Trio 3T dedicated human research scanner in the nearby Psychology and Interdisciplinary Sciences building. There are also research scanners for post mortem brains in the Biomedical Imaging Technology Core (a Bruker 3T and a Bruker 9.4T), and primate scanners at the nearby Yerkes National Primate Research Center (a Siemens 3T and a Bruker 7T). 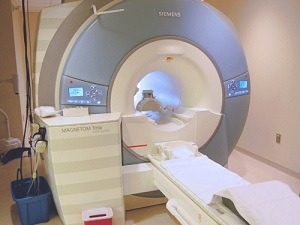 The Wesley Woods Medical Center houses a cyclotron and PET imaging facilities.